On our Facebook community page, more than 400,000 of us inspire one another daily through positive messages, quote memes and anything else that encourages happy and loving marriages. But more importantly, as I always remind them, there is only one person we can change. When you point your finger at another, there are still three fingers pointing back at yourself. And such is life. 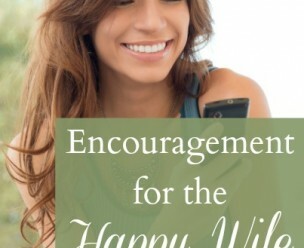 I want to make sure all those who want to be happy in their marriage, and are committed to taking that first step, read this post written by our fabulous HWC contributor, Cheri Gregory. Until Monday…make it a great day! 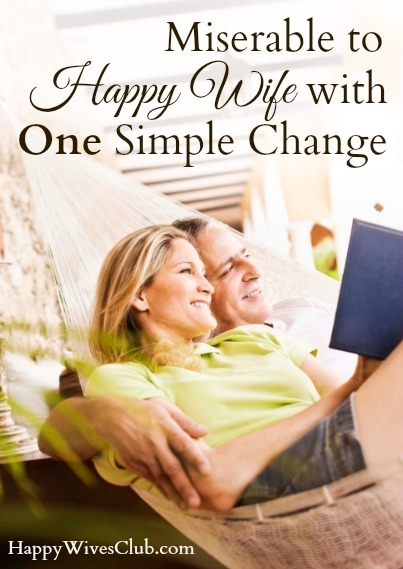 Confession: I haven’t always been a Happy Wife. For years, I was the reigning president and sole member of “The Most Miserable Wife Club.” Nobody brought gifts to my pity parties and the entertainment was terrible! I was sure that my husband’s many problems were the cause of my unhappiness. So I spent my days mulling and stewing over them. Daniel had a problem with over-reacting to poor drivers. He’d talk at them while they were in front of him and then mutter about them long after he’d passed. Even worse was his spices-should-be-alphabetized problem. He blamed me when he reached for cayenne pepper but ended up with nutmeg in his chili. Then there was his serious lack of sociability problem. He preferred to stay home –– “Just the two of us, Babe!” he’d say –– rather than attend potlucks or parties together. 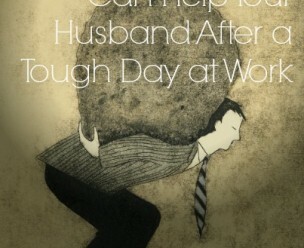 I tried for more than a decade to solve “my husband’s problems” by whining about them and waiting for him to change. I expected my misery to motive him. Unfortunately, I was labeling my own personal preferences and expectations as “my husband’s problems”. This was not beneficial nor helpful to our marriage at all. Reading books like Why Marriages Succeed or Fail by John Gottman and Love and Respect by Emerson Eggerichs, I discovered that what I’d been calling “my husband’s problems” were not his problems after all. As I started recognizing my personal preferences and expectations –– and taking responsibility for my reactions and needs –– “my husband’s problems” vanished one-by-one! With my vision no longer obscured by irritation, I began to notice Daniel’s myriad strengths and see all the positive contributions he was making to my life. I finally felt free. To enjoy my man. To be fully present in our marriage. And to give my husband the gift of a happy wife. Cheri Gregory is a Certified Personality Trainer; contributor/co-author of a dozen books, including Wired That Way and 21 Ways to Connect With Your Kids (with Kathi Lipp); and frequent speaker for MOPS groups, women's retreats, parent workshops, and educational seminars. She holds an M.A. in Leadership and is working on her PhD. Cheri has been "wife of my youth" to Daniel, a pastor, for over a quarter-of-a-century; they have two college-aged kids. She blogs about expectations, “baditude”, and hope at CheriGregory.com/blog.